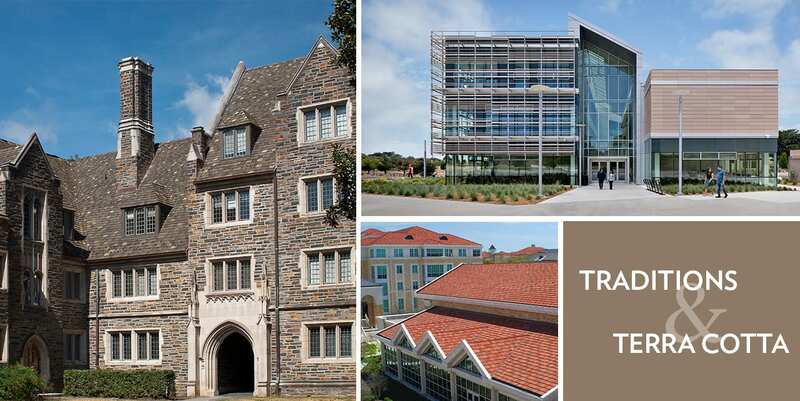 Since 1888, Ludowici has been the premier choice for colleges and universities seeking uniquely beautiful architectural terra cotta for their campuses. We have a proud history of partnering with some of the most beautiful and prestigious colleges and universities across the country. From traditional roof tile profiles for classic collegiate style, to quarry tile for promenades and flat roofs, to uniquely beautiful, modern terra cotta wall cladding solutions and solar shades, Ludowici offers a robust range of terra cotta products to fit the wide variety of architectural styles found on today’s college campuses. Fill in the form below to contact our dedicated colleges and university representative for product literature, samples and pricing, or to request a personal lunch at learn at your campus.